» Join the Numeracy Booster Camp Summer 2019! If your child wants to ‘up’ their math game, or you were considering a tutor, these camps may be for you! -Physical movement to help students learn about the important relationships and patterns found in math. We are looking for students who are interested in: improving their math skills, confidence in math, learning about math in different ways and who enjoy working with other students to explore concepts. We will focus on developing growth mindsets about math because we believe that all people can learn math. My daughter attended Nikki’s Math Camp last summer for 1 week. She went into the camp unsure of numbers and with little numeracy confidence. She struggled with math in school and carried anxiety around most numeracy related activities. Since attending the camp she has been confident and successful with numeracy. She has straight A’s and truly understands numbers and their operations. Before the camp numbers floated around in her head and she desperately tried to memorize operations. Post camp she is in her words “better able to process the activities related to mathematics and is no longer anxious in numeracy”. 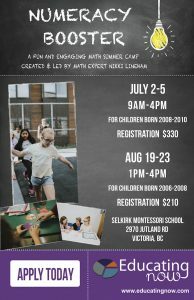 I highly recommend Nikki’s Math Camp if you want to change your child’s outlook on numeracy for the better. It has changed our worlds. Our daughter had the pleasure of being in one of the recent Educating Now Summer Math Camps. Nikki was so great at helping her feel more comfortable with Math. In Grade 5 she was struggling with finding strategies that would work for her learning style. Through the Summer Camp, Nikki was able to help our daughter find new and fun ways to solve math problems. This year in school our daughter is doing so much better and appears to have much more enjoyment and less frustration when it comes to Math. Many thanks to Nikki. We highly recommend her teaching style and her overall personality as an innovator in math. Thanks so much! Download for more information on the camp. Check out my Ted talk to learn more about me and my approach. We will be filming parts of this camp to use for instructional videos for educators on our site Educating Now. We will also be using some still photographs for blogs, tweets and other instructional purposes. In order for your child to participate you must be comfortable with this and sign the permission forms.